Learning a language is a powerful mental workout that uses every form of memory we have. We need to acquire a repository of words, to form a vocabulary vast enough to express our messages. We also need the grammatical knowledge to put it all together. We need to use our muscles and motor control to wrap our tongue around the pronunciation. And we need to be able to do it fast, intuitively, without stopping to think about each translation. Fluency in any language requires a higher order understanding of it. Memorization will fall short, you can’t just accumulate words, you need to see the relationships and interactions between them. As with many other higher forms of knowledge — such as music theory, a programming language, math or physics — it’s essential to see the whole system, to take a holistic view and understand intuitively how each piece works within it. Learning a language is not easy, but in a way that’s the point, you need to be patient and put in the effort to see the reward. And it is a great reward. Outside of the obvious travel and social aspects of language learning, we also change our brain in numerous ways. Knowledge of more than one language has demonstrated in studies to improve attention, memory, and self-control. Ellen Bialystok of York University discovered that knowing two languages delayed dementia by 5 years. Three languages delayed it by 6.4 years, and four or more languages delayed it by 9 years. Strangely, it seems that our personality is intimately linked to the language we speak. Our words are part of our identity. We all talk to ourselves, and studies have shown that in the event that someone loses their ability to speak, they also report feeling like they lack self-awareness. They lose a part of who they are. Psychologists has also found that people behave differently depending on the language they’re speaking, and they may change the way we perceive the world. When Keeley studied Chinese speakers learning Japanese, those that could empathize with others and see from new perspectives more easily were the ones that reached greater fluency. If what we say to ourselves is part of who we are, then the language we speak in will help define us. Learning more than one language will give you a greater range of self, allowing you to empathize more easily and adapt to situations more effectively. Some have said that if you don’t learn a language when you’re young, the chances you can do it when you’re older fade dramatically. The critical period hypothesis, as they call it, is not quite right. It’s true that a child can and does learn a language quickly, but it’s far from true that an adult cannot. The brain is malleable, and changes with every experience, every new piece of knowledge. Neuroscientists have discovered just how adaptable the brain is, defined as neuroplasticity, and it shows not only that we can learn at any age, but that we should be continuously learning. Another common mistake that creeps up in language learning, and learning in general, is that it can or should be easy. It’s not. The fluency illusion is a bias that creeps in when we don’t have trouble recalling something. If you read the translations of a few words, repeat them to yourself a couple of times, and think that that’s enough, then you’ve succumbed to this illusion. Real learning means testing yourself, it means coming back the next day and trying to think of the translations without looking. To learn is to struggle. Carol Dweck has studied the way people look at their intelligence and abilities. For some, they see a static, unchanging aspect of themselves. This fixed mindset causes people to think that they are as smart, and as capable as they’re ever going to be. The other type of mindset Dweck has studies is the growth-mindset. People who live with this view believe they can get better, they can become more intelligent. They see problems as challenges to be overcome, they see failures as lessons to be learned. Take a growth-mindset to learning a language. Seek out the challenges, make it hard on yourself, stretch beyond your capacity. Now that you know the benefits to learning a language, and have some insight into the problems and illusions that often get in the way, it’s time to start learning. You’ve probably heard about the benefits of immersion. You will learn a language most effectively if you can run off to a distant country and throw yourself into the deep-end. That’s true, and highly recommended, but not applicable or possible for everyone. Fortunately, there are many alternatives. Duolingo – This is both a website and app for iPhone and Android devices. It’s free, has most of the popular languages, and tests you in writing, reading, listening and speaking. 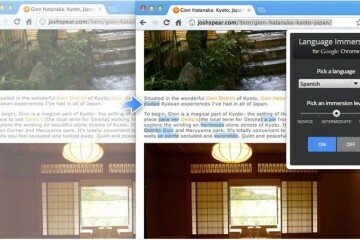 Chrome Language Immersion – This add-on for Chrome browsers changes short passages of text in the websites you visit. As you read you’re asked to translate, you can hover over the text for a spoken version, or click it for the original text. Here’s a video on how to use it. Mindsnacks – Language learning as a game, it’s fun and effective, with higher levels unlocking new games. Tandem – A free language exchange app for iPhone that allows you to practice your language skills with people from around the world who share your interests. You might also want to employ some other methods. Try listening to the radio or podcasts in the language you want to learn; watch movies with the subtitles on; or find a native speaker through Couchsurfing and arrange for a language exchange through Skype. There’s a multitude of ways you can help yourself, but I find the one thing that’s essential is motivation. You have to be willing to put in the effort, and not get distraught when you feel like you’re not making progress. Don’t quit, know that the effort you put in will be more than worth it in the end. I like that you point out that one of the best ways to learn another language is to throw yourself into the deep-end and immerse yourself in that language. I remember taking Spanish classes throughout high school and not remembering anything. However, once I lived in a Spanish speaking country for two years I came back fluent. It is also helpful to surround yourself with people who know the language that you can go to for help.